One of my special treats is being able to share my needlework with others in different places doing different things. My favorite venue is the riverboat stitching cruises. Why you ask? Well, I have taught on the large ocean liners but I wasn't that fond of the few times that we hit rough seas - get queezie easily. I don't like looking out and only seeing ocean most of the time. There is always something to see from all sides on the riverboats. The ocean liners are so large that they seem very impersonal to me. On our smaller venues we have better opportunities to add new friends that we have met through our passion of needlepoint. But that's just my personal perspective. 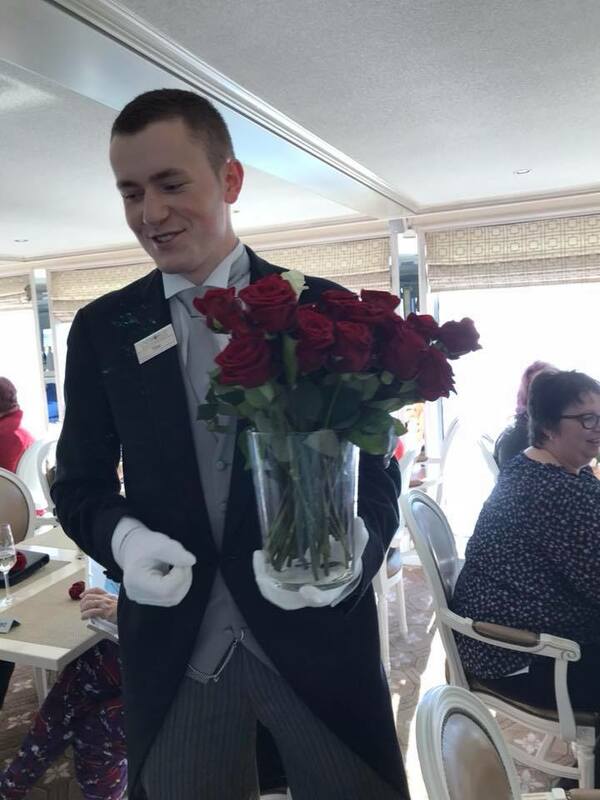 Riverboat cruises, to me, are just like floating hotels. We don't even know they are moving. We stop frequently and just step out on the land - be it Italy, Germany, Greece, wherever. While in Venice last year I loved that after our morning excursions and after our lunch we were able to stitch or have a class. After dinner, my daughter asked our tour guide about the safety and feasibility of wandering onland and he encouraged her to do so. She had the best time visiting more little kiosks along the Grand Canal and did not need to wonder far at all (she's a shopper, I am not). We loved walking on the plaza around the Cathedral and just taking it all in. No hurry no worry. I think serene might be a good description of this way of travel. I recall when I had a 'real' job that our vacations tended to wear us out. We tried to take in so much and ended up going back to work to rest up. I have never felt that on our riverboat excursions. The smaller ship affords a better opportunity to get to know fellow stitchers (I mean cruisers) and share our passion in a different setting. But not only our fellow cruisers. Our crew went above and beyond to spoil us. We seldom had to tell them what we might like twice. 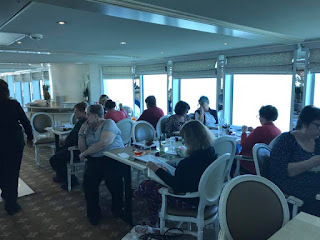 Wherever I went on the ship - lounge, upper deck, library, lobby,(stitchers were spread out everywhere when at their leisure) here they came with my diet beverage. Or breakfast our drink of choice was in front of us almost before we were seated. My husband chose to spend most of his down time on the upper deck, stretched out, supposedly reading, but mostly being catered to. He never had to move if he did not want to - his snacks and his beverages were just a finger lift away. We never lacked for stitching time. One day I even opted to bypass the included excursion and just stay onboard and stitch with some others who did the same. Just because the excursions are included does not mean that we must take them! While we had an optional class with kit, there were some surprise workshops along the way too! What fun! We made a souvenir ornament one day that my guests did not expect, and we made a lanyard from beads for our scissors on another time. 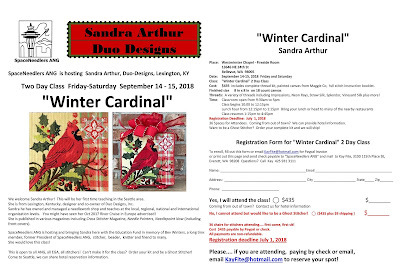 These were in addition to the optional class and free for all the registered stitchers. We did not lack for activities that's for sure. 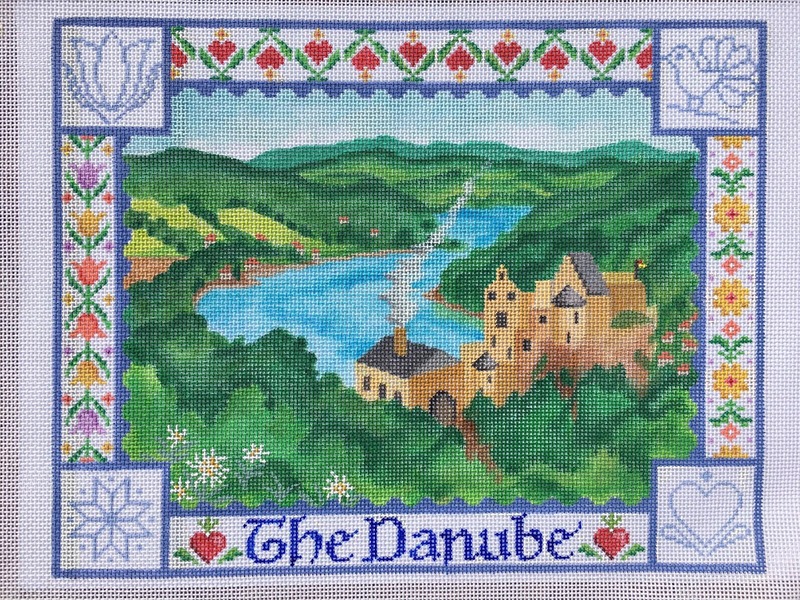 So I am gearing up for our riverboat stitching cruise for this year - Stitching Down the Danube. As I prepare some of my surprises for my participants it is bringing fond memories of past cruises and I can't wait. We will be following a similar itinerary as for Italy but this time we will be visiting 4 countries. We begin in Prague, Czech Republic. There we will have our first night of class after dinner one evening. Then we head for our ship and for Germany. We'll work in another mini-workshop while in that area as well. 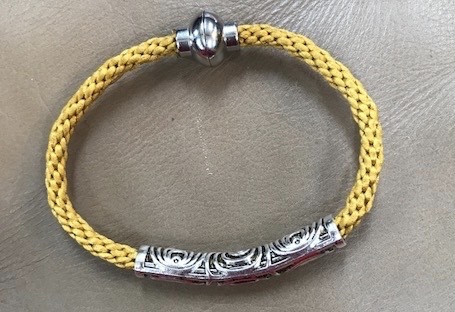 This one will likely be the optional Kumihimo bracelet project. After all who can't use another piece of jewelry on their holiday? We will be able to make and finish this delightful piece and wear it while there. While cruising through Austria, if I read the itinerary correctly, we will have a full day onboard the ship as we view beautiful scenery along the way. 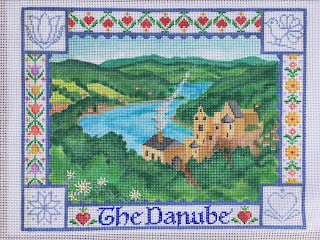 On this day I plan for us to concentrate on the optional class kit of The Danube created by the talented Kate Dickerson just for us. 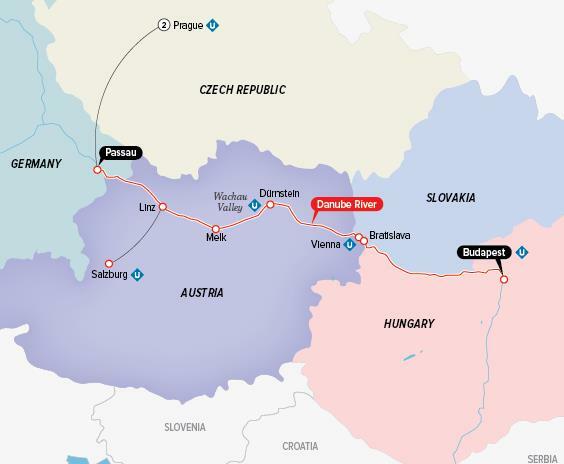 My initial plan is to briefly discuss the various techniques and areas while we are in Prague that will afford the opportunity to get some of the less-technical type stitches done by those who choose to do so. That will leave our f2f time for more intricate things such as ribbon embroidery, beading, and specialty stitches. We will also create our own bargello pattern. Vienna is very exciting for me! I had hoped to get to see "The Kiss" and "Judith" by Klimt. Our agent is checking with UniWorld to see if the Belvedere Museum is actually closed on Monday between September and May as stated in our brochure. The Belvedere's website states it is open. Well surely there is plenty of other references to feed my 'Kiss' viewing desire even if not the read thing. I'll be where it is - right? Oh, and there will be another mini-workshop somewhere along the way here too. Wonder what it could be? This might also be optional and I'll provide details once I get all the facts and materials together. And lastly we will go to Budapest - the homeland of my Grandparents. My mother was Hungarian. Sadly, we do not know much of the background as our Grandparents were very closed mouth about their history. 'Smith' doesn't tell you too much lol. And my Grandpa felt that they came to America to be American so very little of the culture was shared with the younger grandchildren. But I'm excited to see it anyway. So good news bad news . Good news- the ship is full! Bad news - the ship is full! If you are considering future excursions with us please try to plan early as we never know how the interest will develop nor how quickly it will sell out. If you are still hopeful of joining us contact Liz our agent and asking about being added to the wait list. You never know. And I think there may be a couple ladies who 'might' be coaxed into sharing. Just a little stitching share. We have a very long project called Arctic Parade by Brenda Stofft that were have been working on for 2 years and probably will be working on for 4 years more. Below is photo of one side - yes there is another side just as large. Did you catch that design size? Anyway here's a section we shared this weekend to the class. The front side of the blanket is now finished except for the tassels which will be added much lager.